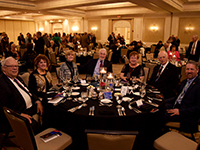 The School of Pharmacy's Pharmacy Alumni Association held its 34th Annual Alumni Conference and Awards Banquet on March 16-18 at the luxurious Nemacolin Woodlands Resort, which is known for its 2,000 beautiful, wooded acres in the Laurel Highlands of Southwestern Pennsylvania. Alumni from all over the country were in attendance. The conference hosted several events, including a continuing education speaker series, Saturday evening Mass with Fr. Shawn Anderson (P'92), and Deacon Greg Woods (P'73), followed by a reception and the awards banquet. With over 150 alumni in attendance for the dinner Saturday evening, the conference was well attended. The Pharmacy Deans Society recognizes individuals who have supported the School of Pharmacy at an annual amount of $2,500 or more and are designated as Associates and those who have contributed a cumulative of $50,000 or greater are designated at Fellows level. The 2018 Associates of the Pharmacy Deans Society include: Andrew J. Altobelli, Margaret Artz, James and Sofia Beaumariage, William & Maureen Bell, Michele A. Belsey, J. Douglas Bricker, F. Kevin Browett, Steven L. Buraczewski, Craig G. Cochenour, Susan DeCarle, Edward DePaz, Ernest & Evelyn Dostalik, Lorraine Duncan, Thomas Elias, Edward & Barbara Erzen, James Gillespie, Diann Glickman, John Grabenstein, Mary Gyi, Donna J. Hazel, Nancy A. Huff, Jason Hunkele, James & Irene Ingram, John & Patricia Jarzynka, Trudy King, John Lech, Dolores Lovin, Barbara A. Martin, Barbara A. McElroy, George McMillin & Susan DeCorte-McMillin, Mary Meredith, Michael Mermigas, Terri Micolucci, Barbara O'Donnell, Lisa Odeh, Maureen Prack, Christine L. Rafferty, Mary Jo Reilly, John R. Reynolds & Lynne Sylvia, Betty Robertson, David D. & Angela D. Shetter, Dave & Monica Skomo, Ernest Skultety, Frank Sorgi, Leonard Stevens, Charles J. Trainor, Louis & Barbara Vottero, and David J. Wargo.